Door latches are a type of mechanical hardware used to fasten doors and keep them shut. A door latch uses a fastener attached to two ordinarily separated surfaces, most often the door and the frame, to prevent the door from swinging while still allowing normal operation when the latch is released. Though latches have traditionally worked in conjunction with locking mechanisms, recent latches combine both latch and lock into one piece of hardware. Door latches are closing devices used on all types of doors including interior, exterior, sliding, swinging, cabinetry doors and more. 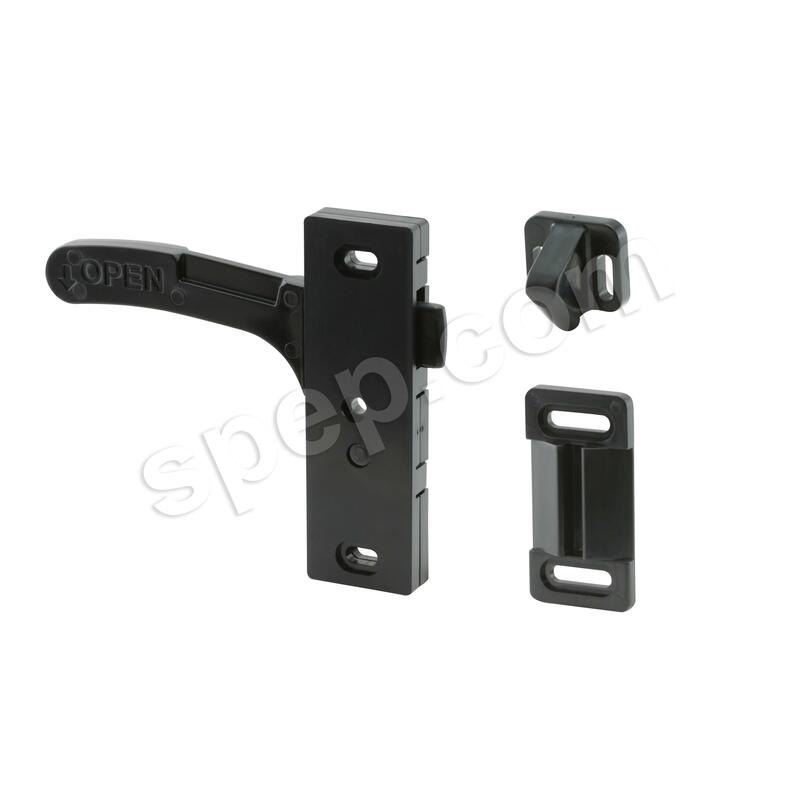 Latches are designed for controlled operation of opening and closing doors, and allowing for a secure connection. Most homes, offices, industrial settings and buildings that use standard doors use some variation of door latch. Additionally, these mechanisms are used in the auto industry for car doors and compartments, and in several household appliances. A dishwasher, for example, uses a door latch to keep from falling open while in use. The wide range of use is mirrored by the many different door latch designs available including bolt latches, spring latches, slam latches and compression latches. Required to be sturdy and durable due to high traffic and potential stress loads, door latches are commonly made from strong materials such as stainless steel, steel, cast iron and zinc. For doors that are used with lighter operations, plastic latches may be manufactured from high strength thermoplastics. These offer the added benefits of flexibility and high impact resistance. For aesthetic purposes for high visibility doors, the latches may be made of materials such as brass, or coated with paints, powders or materials such as chrome to ensure an attractive finish. No matter the material employed in the fabrication of industrial latches, there are three basic components to those used in door systems. The basic types all range in design and complexity but in general, each latch is composed of separate plates that are attached to both the door and the adjacent frame. One plate, typically that of the frame, has an internal notch, external loop or groove. Another component, most often a bar, pin or hook, attached to the door plate is left free to either swing or slide into the notch, loop or groove. In spring door latches, a spring pushes the pin or bar into the corresponding notch or groove on the adjacent plate. A knob or lever is attached to the sliding portion of the door latch for retracting and extending the free moving component and can be used for opening or closing purposes. When extended, the latch holds the door in place by maintaining the connection between the door and the frame. Retracting the pin or bar allows the separation of the two and for the normal range of motion of the door. The components of a door latch are commonly formed from stamping. The stamped pieces are later assembled and spot welded into complete latches, although the process differs slightly for each type of latch. Mortise, rim and spring loaded are among the most common types of door latches.